Thank you Heather. This was my first time having a reading, and my heart is full. I look forward to next time in 6-9 months. It brings so much comfort in knowing (my passed loved ones) are okay. Ive been having such a rough year after my Dad's passing and no amount of grief therapy has helped me the way you just did! Thank you again so much! Heather, you have helped me through so much! What is so different about you from others, is that you sincerely care. Heather's ability to connect me with my loved ones in extremely specific ways was absolutely mind blowing! I was very skeptical in general, but from the beginning to the end of my time with her, she brought me messages from my family with details that no one on earth could possibly have known. I have so much more peace with my losses now that I've met with her. She is without a doubt gifted with that special something that spirits want to latch onto. She has changed my outlook for the better. Oh Heather! I can't begin to tell you how much that reading meant to me. Thank you so much. I felt my Dad's energy was definitely there, and then the way you would move your hands and gestured like him, and the specific things you brought through made it seem almost as if I could see him again! He was right there talking to me through you! The work you do is so spiritual and powerful and deeply personal and you handle that all with so much grace and dignity. I just adore you. Thanks again. I want to share that I just had a phone reading with Heather and she connected with my husband. 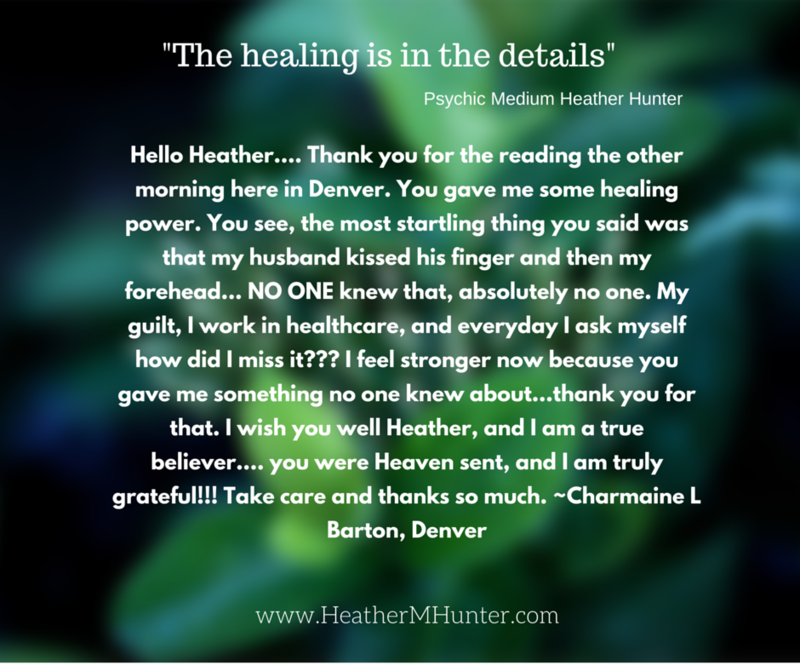 I've had readings with a couple of others mediums and they were good but Heather was EXCELLENT! I felt like I was actually talking with my husband. He said things no one would know but he and I. He told me what he was doing and what was going on with him. It gave me so much comfort. He knew what I was doing and how I was feeling. If you want to connect with your passed loved ones you cannot go wrong with Heather. Heather came to my home to read for myself, my sister, and my mother and she was such a joy. From the minute we met her we felt a sense of comfort and love and that only escalated during our reading. She absolutely connected with our loved ones in such a strong way and brought so much clarity to all of us. She really is a telephone between us and our crossed over loved ones!! We will definitely be meeting with her again. Cannot recommend her enough! I was at your reading event yesterday. You gave me so much peace. It's been 2 years since my best friend passed. And having him come thru in spirit meant so much. You mentioned that someone in the family thought the spirit might be in purgatory. It's me. I've thought that for 2 years since his suicide. You telling me that he's not and is ok...words can't express my relief. You mentioned a stapler, it didn't have meaning then. But it does now! I remember one time my friend's tie tore and he had too staple it! It was hilarious. Thank you from the bottom of my heart. Peace and blessings to you and your family. I wanted to thank you for all of the messages we received the other night! For 12 years I have wanted to reach out to a Medium, but I let fear hold me back. Your gift is amazing!!! Once again thank you!!! I just attended your group in Arvada, and I am absolutely blown away. I'll be honest,I was a little hesitant, but you are incredible! I would really like to do a private meeting, or have you come to my house! Thank you for tonight! "Thank you for confirming that love never dies. What you did for us is unexplainable!" I planned a private session with Heather. I was a skeptic, but it did more than I could ever imagine! Every time I was wanting more, Heather did or said something my deceased Mom always did when I was young. There's no way she knew what she did! I'm already planning another session! Thank you for letting a Mother in spirit tell her Daughter she is Ok. I contacted Heather for a private reading in hopes of hearing from my Dad. I received some very meaningful messages and several positive validations today. She shared details which have brought me much peace. I will carry this in my heart forever! Heather, I thank you more than words could ever express! My session with Heather was invaluable! So many random and definite/specific messages were shared that could not have been known by anyone other than my loved ones that have passed! After losing both of my siblings this year, the comfort I received in their absolute messages, was so healing. Their personalities even came through in their messages. I left with no doubt of Heather’s gift. Heather is extremely gifted! She came to our home and provided a warm, funny and heartfelt reading. Her accuracy is to be noted! My mother and I have experience with other reputable and even celebrity mediums, including John Edward. We were not looking to compare Heather to them---we believed she either knew her stuff or she didn't. She did! She absolutely did!! She explained details and emotions very well. We highly recommend Heather. You will not be disappointed. Heather was SO spot on with information concerning my loved ones on the other side. She was patient, informative and humorous with messages expressed from both this side as well as the other side. I experienced much needed closure as a result of this wonderful reading. I would recommend her 100% to potential clients. She is a delightful person - full of fun and really knows how to communicate with the other side. If you're looking for the real deal, Heather is just that! It's often the case when meeting with intuitive people that you are questioning in your mind whether they are being general, or if they have been 'touched' with the gift. Immediately, she was welcoming, full of energy and very informative on how to receive my reading. She advised me I was welcome to record and also to write down information given, since it may be relevant later (And she was right!). When Heather spoke with loved ones in spirit that had passed on, she was very much on the money! She spoke of my father as if she had met him! I have been to many different mediums and was always disappointed. You will NOT have that experience with Heather! I HIGHLY recommend Heather, she is worth every penny! This is a great way to help yourself heal with the loss of loved ones and to open your mind to having a new outlook on life as well as death. I had Heather read for me and then a month later had her come back for another reading. Sometimes we are thrown so much pain with losing a loved one. I have had my fair share of psychiatrists/medications which did minimal healing, when compared to Heather! She connects to our departed loved ones and has the ability to hear and validate with specific details that they are still here with us and it brings a powerful type of relief. I was very skeptical at first (as a majority are) but Heather will tell you things only you and the loved one would know! Amazing! Heather was amazing! She was able to connect with my father, whom I was hoping would come through. We also had some surprise spirit we connected with as well, which made it a lot of fun! I will definitely use her again, and HIGHLY recommend her if you are looking for a medium! She is very sweet and was a Godsend! Thanks Heather! When I made an appointment with Heather, I was not sure what to expect at first. I had recently lost my husband to suicide and I made an appointment for myself and my twin daughters. We went into the room with Heather and immediately it was apparent my husband came through! He was his typical self right away, joking around. There were things that Heather brought up that no one would ever know, such as socks of his we were all wearing at that very moment that she could not even see! She knew about a bandana of his that I always smelled. The things that she brought through from him were comforting. A few of the things we could not understand at the time. However, we did record the session and have listened a few times and have now connected things that were brought up that we initially did not understand. Heather you are an amazing person with an amazing gift! Thank you so much! Dear Heather, Thank you so much for the messages tonight!!!! It was amazing & Ive wanted that for 20 years! I would love to connect again! Also I reached out to my friend to share the details about her son that you brought through tonight. She was SO happy!! Made her year!! So thank you from both of us from bottom of my heart! Heather was so instrumental in giving me peace and comfort after my husband's passing. He passed away two months ago, and I just wanted to talk to him, feel his closeness, one more time. First, Heather validated that she was indeed connecting with him; no one could have known the facts Heather brought up while in communication with my husband's spirit other than he and I. Heather's compassion and caring radiated through the session. You will not be disappointed; you will gain closure and comfort. I had a session with Heather and it was awesome! I believe that she truly connected me to my loved ones and that she honestly cared about what both sides were trying to convey to each other. I have had A LOTof loss in my life and I have finally found the peace that I have sought for so long thanks to Heather! Hi Heather! Just wanted to take time to thank you for the phone reading!! It was really comforting for me to reconnect with my late husband!! If I was ever, even a little skeptical, I certainly am now a believer!! This was the first time I've ever done anything like this!! I laughed, I cried, and was absolutely amazed by the whole process!! The bonus was that Mom and my friend Eddie also stepped forward to let me know they are also looking over me! I'm hoping, Heather, that we can do it again soon! I recently, suddenly and tragically lost my young niece, and would love to hear from her. Thank you so much Heather!! Heather, just wanted to thank you so much for the incredible session yesterday. I feel like things are finally starting to come together now. I'll be thinking about you! I’m one happy customer! My experience with Heather was utterly amazing! She was kind and compassionate. Heather gave me a true sense of peace, when I was desperate. Through the details Heather was able to share, I know my passed loved one is okay, and around me. She made me feel very comfortable for my first time! She was so detailed and accurate on everything! She is simply amazing! " Heather gave me soo much information through a phone reading that no one would have known unless they were family. It was truly amazing! She brought me peace when my son came through to her. When he passed, I thought he had left me forever. I was very depressed. But now after Heather's reading I have been much more happy and relaxed. She specifically acknowledged that my son's unique pet was with him and even the specific treats he fed him, and mentioned the 2 jackets of his that I wear. She said my son knew I was wearing one at that very moment as we spoke on the phone, and my son shared it had a broken zipper (which it does!) She helped me realize through specific details such as these and so many more that my son shared with her-- about my life, and the signs I have experienced and wondered if it was him-- that he is still here with me. He was even funny, and shared that he wants me to laugh more instead of crying. Thank you so much Heather.... you will hear from me.... and hopefully my son again! You have given me hope! Something I was lacking. I thank you from the bottom of my heart. You have changed my life! Heather is amazing! Not only does she truly have a gift of being able to communicate with those who have passed, she is also very sensitive to the feelings of the person she's doing the reading for. This was my first experience with a medium reading and Heather put my nerves at ease from the very first moment we spoke. 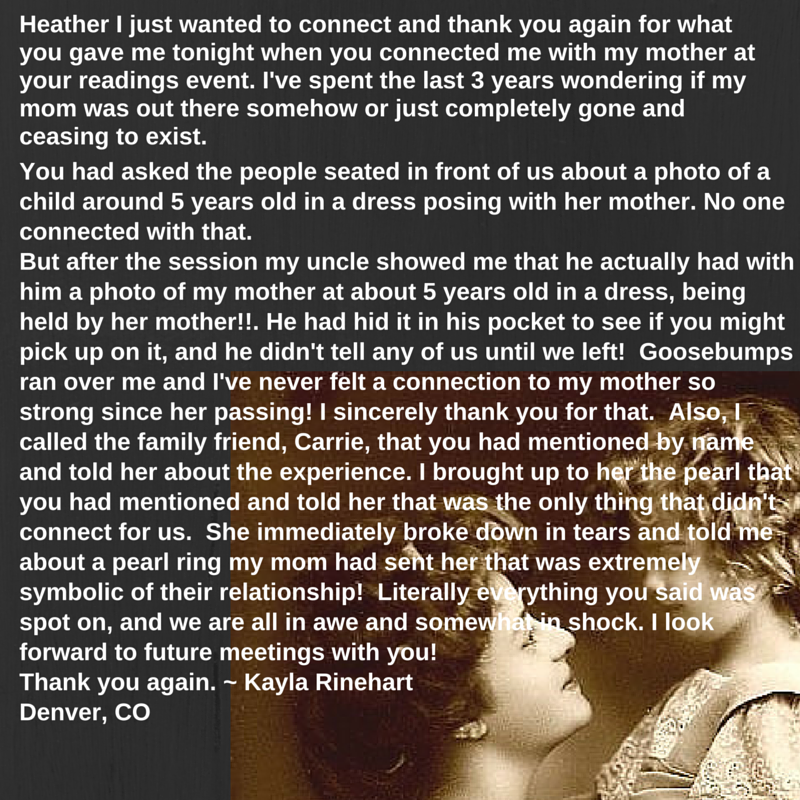 Although it was a phone reading, I felt like Heather was in the room with me and her reading was filled with spot-on information that she never could have known without a genuine connection to the individuals have passed. I highly recommend Heather! I had a reading with Heather and it was amazing! If you are looking for the real deal come to HEATHER!! She communicated with my brother. She told me unique things only me and my brother knew. It was amazing! I would do it again! Heather mentioned specific things that happened to me the night before-- and it shocked me because I was home alone! She said also that my brother was standing beside me while I braided my hair. She couldn't have known this! I am so grateful to have had the chance to have a chat with my brother in the spirit world. Thank you Heather!! I will be in touch. I lost my daughter to brain cancer . She was only 18 years old. The incredible pain over her loss was and still is overwhelming. Heather and I are Facebook friends. I was contacted by Heather via Facebook. She wanted to email me with specific messages from my little girl that could only be coming from my daughter! Heather shared such detailed messages that I could almost feel my girl around me !! We also spoke on the phone. Those messages helped and still are helping me to cope with this pain and grief in a way that without them I would not be able to make it through my every day life . Heather is such incredible human being that I feel she surely was specially chosen by my daughter to become the communicator for us. I can only highly highly recommend Heather ! Thanks to her, this horrible loss has been somewhat eased and brought hope to me that our loved ones are around us , with us . That love never ends. There is no way Heather could have known what she did unless she was the real deal! My mom passed in 1999 and Heather told me things that NO ONE else would have known - secrets only my mom and I knew...specific ones too-- like unique nicknames and expressions between the two of us. If you are wondering if Heather is legitimate, you can rest assured that she has an incredible gift. Not only that, but she in this for the right reasons - to connect those who have passed over with their loved ones on earth and help us heal. Heather made me a believer! I now know for certain that the soul DOES live on. I so highly recommend her services! It changed my life! I know you won't regret it-- but you might if you pass her by. She's an earth angel put here to help bridge the gap between life and death, and between hearts broken apart by circumstances. I cannot put into words how Heather has helped me with all I've been going through since my girlfriend has passed away. I have been crying--constantly wondering if she forgave me. Wondering if she's here beside me, listening to all I say to her. Heather has definitely proven to me that my girlfriend IS still with me! I knew Heather was speaking directly with her, from little things like the name calling my girlfriend used to tease me with, and the way she spoke to Heather like she would speak to me about what we would be doing in our future as future parents. There is hope! I had lost it all but Heather reached in and helped me find it through speaking with and seeing my girlfriend. She's not with me physically but she is in my heart and I feel her soul and warmth day by day. Thank you Heather!! I have lost of a lot of people in the last few years, I made an appointment with Heather in hopes of connecting with at least one or two of them. Well Heather brought through so many and was so spot on with information that only I knew! I knew 100% I was speaking with many of my loved ones! I recorded our session and listened to our talk later and was blown away once again at how accurate she was with DETAILS! I absolutely recommend Heather and her abilities. She gave me a peace that I have desperately been in need of for such a long time. We had the pleasure of meeting with Heather and we were blown away by how accurate her reading was! I’m still amazed and in awe. I was a true skeptic, and now I will be hiring Heather for more sessions in the near future. We can't stop talking about this very gifted lady and have recommended her to even our skeptical friends and family members. She is authentic, and gifted! I met with Heather a couple of weeks ago and was blown away by her accuracy! She knew specific things about my family members—living and departed--and even about the departed animals in my family! I encourage anybody out there who wants to have a reading done to contact Heather! She is very kind and so welcoming and really guides you through the process. The hour was up way too soon and I will be making another appointment to see her. Heather, thank you so much for the reading last night connecting me with my loved ones!! It really put my heart at ease. I was tickled pink that I got to hear from three different people that have passed in my life! So many times when something special happens in my life, I have to stop and just say "Thank you Jesus." Now I know, it was not only Him, but a little help from His “angels” too. Thank you for being able to pass on these wonderful messages to me. I was laughing one minute, and crying the next, very emotional, but so nice to hear from all of them! I was surprised that my friend who just passed a few days ago also stepped forward! It was all so meaningful and touching!! Thank you, thank you!! My beautiful daughter passed away on august 7th of this year. She had relapsed with brain cancer. Shortly after Leah's passing, I was communicating with Heather more than usual though Facebook because my beautiful daughter had chosen Heather to get messages to me!! I was blown away by the accuracy of those messages! Also by the incredible comfort that those messages were and still are giving me! Losing a loved one is the most painful thing, but losing a child is not even explainable! Heather’s messages from Leah continue to help me cope with this horrific pain and therefore I'm able to make it through one day at the time. It is almost like I'm having therapy sessions when Leah contacts Heather! I'm forever grateful and feel very blessed that my daughter chose Heather to let me know that she is happy and in peace now! I can highly recommend Heather and her mediumship Gift! Love and blessings to you Heather! I thought I would share something with you. When we had our session you told me my grandmother on the other side said something to you about a family reunion. I didn’t know about one at the time. You also asked me about a brother’s necklace with dog tags and I told you that my brother wasn't in the military. Well, I forgot that I do have a brother that was in the military... I have never even met!! That is, until now. On Wed of this week we made contact! We have both been looking for each other for years! And then the very next day my youngest brother, whom I haven't spoken with in about 4 years, made contact with me! So the family reunion IS coming to fruition! Wow. It's so comforting to know that you were able to help me and my family, past and present! Thank you so much! I had one of the most amazing readings with the lovely Heather Hunter! I've been fortunate to have seen her in person and over the phone. She spent a whole hour with me utilizing her psychic and counseling gifts and helped me with direction in my life. So patient, genuine, kind, and GIFTED!!! Heather I deeply thank you for the guidance! Dear Heather, just a quick note to tell you how wonderful it was to meet with you yesterday! The depth, breadth, and accuracy of the things you shared with me during my reading were truly astounding, and I feel so blessed to have been able to be on the receiving end of your gift!! The infusion of hope that you provide is second to none!! I recently attended a group reading with Heather Hunter and I have to say that she is such a genuine, kind and beautiful person and a truly amazing medium! Heather's readings have a lot of detail in them! The beauty of such detail is that they give validation that the person Heather is receiving information from is actually the loved one. For example, Heather immediately picked up on "clam chowder" when my deceased grandmother was connecting with her. Such a seemingly random piece of information was actually linked to one of my strongest memories of my grandmother and I knew right away it was her that was speaking with me through Heather! Plus all of the other details were right on as well. The validation was such a comfort to me! Heather is extremely respectful of both those in body and in spirit! I recommend Heather for group readings and events in your home or anywhere! She is wonderful and you can be confident in her abilities! I attended a private group mediumship reading with Heather Hunter and just have to say that her gift is really strong and unique! I’ve had other readings but the way Heather receives information about unresolved issues and then is able to be the “telephone line” between us and Spirit to bring closure was really profound. I think many of us are forever changed. Thank you Heather! It was great seeing Heather Hunter Psychic Medium at her gallery readings event last night! The details she brought through – for everyone she read--right down to the specific type of candy one man used to bring his mother when she was ill - were amazing! I'd like to thank Heather for the connections that she brought through for me, as well. Thank you for your spot-on reading today, Heather! You were so accurate, I was gobsmacked! I really appreciate the messages from my loved ones. My heart does too! It's always nice to hear from them. I'll be scheduling again soon! Heather - during the reading you did for my sister in law yesterday - you mentioned that her Mother in spirit was showing you a Rubik’s Cube in relation to her grandson, Josh, & speaking about how smart he is. When my sister in law got home last night she called Josh to tell him. He confirmed that he had recently been practicing the cube again - quite a bit!! Thanks again! I would encourage anyone with any curiosity or interest in spiritual mediumship to attend one of Heather Hunter’s public events or group sessions. Recently I went to one she offered, being the first of it’s kind for me. I left that night feeling a lightness I had not felt for quite awhile. The atmosphere Heather created was invitingly friendly and filled with an effervescent energy that had everyone feeling comfortably buoyant. After a moment of silence, she began by verbalizing impressions she was receiving, waiting for an audience member to recognize and acknowledge a personal reference. The evening proceeded with continuous connections being made between those physically in the room and those in spirit. With each confirmed impression, Heather would focus on that individual and convey specific, oftentimes highly detailed statements that brought head nods, verbal affirmation, smiles, laughter, and of course for some, tears of recognition and love. By mid session the room felt filled with countless unseen personalities, crowding in and wanting to make their presence known. I was so impressed with Heather’s ability to calmly move through this, manage and relay statements to particular audience members, certainly a skill that required much discipline. She often spoke with great sensitivity and compassion to those in the audience who most needed it, and shared in the mirth with those who responded with lightheartedness. I think everyone attending went home that evening feeling a quiet, yet joyful knowing that all they had experienced had absolute validity. I certainly was graced with that conviction, and wish to offer my appreciation for Heather’s willingness to share this ability. Her intention to do this work is matched by the unwavering effort she devotes to a group reading. Heather I can't begin to tell you how your readings changed my life. At your gallery readings event, you saw in me a very angry bitter woman and you were very concerned for me. At that point, I had not received a dream or a sign from my son Damon in 15 years. His death was very tragic and it took a toll on me mentally. It took 5 weeks to locate his body in that lake. I told him that I needed to hear from him that night I came to see you. I was compelled to see you... and your messages from my son changed me. Then weeks later we had the readings group at my house. People were amazed. But after everyone left , you sat with me. We talked for 2 hours more. Through you, Damon told me he was with his little sister. Only one other person knew about her--that sad time of pregnancy loss for me. I had since prayed and talked to her, and named her Danielle. Our time together in my dining room forever changed me. I have made peace with the past. I forgave people and forgave myself. I want to thank you for coming into my life. I am always amazed at how resourceful our kids in Heaven are when they want to send a message. They go to great lengths to show validations and they are very persistent if we do not recognize them. Moreover, they want us to take care of each other while here on earth. Making sure that we are okay is very important to them. I went to a gallery-style reading in Phoenix that was given by Heather Hunter. Heather has been a friend for a long time. We held our very first meetings of Helping Parents Heal at her beautiful healing center in Cave Creek called ‘Casa Mariposa’. At the beginning of the reading, Heather told us that she had written down some information that came to her before she had arrived -some of the loved ones she was about to bring through were impatient! The very first thing that Heather said was that she saw a younger male who was a baseball player – she said it felt like he experienced anaphylactic shock - and that he had taken his life . She saw that he had been honored with a ceremony in a baseball field. I told Heather that I knew this boy and that I was friends with his mother. However, I was unsure about the part about anaphylactic shock. She continued to bring through validations. The young man said that his mom has recently been sick. He asked about his shoes: ‘Does she have my shoes? Baseball shoes?’ He also said the number ‘9’ and then once again acknowledged his mother and the fact that she was not feeling well. Although I was unsure about a few of the things that Heather said, I was certain about the baseball, that Andy had taken his own life, and that a ceremony had taken place on a baseball field in his honor. Andy was a star baseball player and his mother LeAnn created a wonderful foundation in his honor when he passed, the Andy Hull Sunshine Foundation, to raise awareness of the high rate of suicide among young people. Its motto is ‘You Matter’. I knew that I had to contact LeAnn the next morning to tell her what I had heard. I was also concerned because Andy had told me twice through Heather that his mother was not feeling well. When I phoned LeAnn the next day, my first call went straight to voicemail. Several minutes later she called me back. LeAnn was exhausted and distraught-she had been driving an RV from North Dakota to Phoenix and had stepped in a hole as she got out the driver’s side the night before. LeAnn had broken her left ankle and the hospital couldn’t do anything until the swelling went down. She was therefore driving home as quickly as possible with no pain killers and a throbbing ankle. She was in Salt Lake City and hoped to be in Phoenix the next evening. As Andy had indicated, his mom truly was not feeling well! Stunned and saddened, I asked her if there was anything that I could do to help. She told me that she would appreciate it if I could bring food to her home the next evening. Although I was very worried about LeAnn, I was also thankful that Andy had pushed me to get in touch with his mom! When I got to LeAnn’s home the next afternoon, I told her about the validations that Heather had brought through from Andy. I said that perhaps ‘anaphylactic shock’ was actually meant for someone else. She told me no--actually Andy had an allergic reaction to the medicine he was taking, Accutane, that had caused him to go into anaphylactic shock. Andy did not die from that shock. Unfortunately, he had indeed taken his own life, as he had shared through Heather. When I asked about the importance of shoes and especially of baseball shoes, she also told me that Andy had an amazing collection with many pairs of baseball shoes and every color of Vans imaginable. He even had a gold pair of Vans that he wore to his prom that matched his girlfriend’s gold dress. There was a large picture hanging in her home that was taken on the day that the ceremony was held on a baseball field in honor of Andy. In it, there were 9 young men standing on the field, all dressed in bright yellow uniforms, and holding Andy’s baseball jersey between them. This was a huge validation of the number ‘9’. This experience made me realize once again how interconnected we all are here on earth and how our children are also united on the Other Side. I know that Andy and my son Morgan are now friends and that all of our kids in spirit work hard to make sure that we are okay. The most important thing is that we recognize and acknowledge the messages that they send us. Love never dies-our kids are watching over us and they want us to be happy! You also asked me if he played baseball or football because my son seemed to acknowledge that someone has been wearing his shirt. A long shirt or jersey. It hit me on the way home. My son played football....and my nephew wears his jersey and his number in football now. The jersey is long and it means the world to him. I attended the Evolve Expo in Denver yesterday with a dear friend. I had no idea what I was sitting down to when we attended your gallery readings session. In fact, when she asked me to go with her, I didn't even know what the expo was about. It was a day out and she was driving so I said "of course!" You were able to channel my father and allowed him to communicate with me in a very unique and specific way. It brought me to tears and I thank you for that! That contact, however, isn't the reason for my email. You had brought in a man who was a drowning victim that no one claimed and you also talked about an anchor and q-tips in reference to his message. There was a q-tip reference that seemed to be a joke for him. You also mentioned the name "Tina". Since this was after I'd already received a message from my own father, I didn't think I'd get another message. Nor did I think I'd get this particular message from this particular man. Let me tell you a brief story. My sister Tia, lost the love of her life, Scott, a few years ago when he drowned at Lake Powell and sunk to the bottom of the lake, like an anchor. It took them 24 hours to find his body. They were estranged at the time of his death and her mourning has been incomplete and short-circuited by this very tragic event and the circumstances surrounding it. We were both very close to my father and I believe that my father and Scott were both working with you to get this message to me - for my sister. I didn't claim Scott as my drowning victim because I honestly didn't think the message was for me...at first. The q-tip reference was lost on me until I spoke to my sister about this experience. She is a jewelry artist and uses q-tips extensively. She was about to run out of them and for the last two days had q-tips on her mind and on her grocery list. By yesterday morning, she'd placed the last few q-tips in her studio and made a mental note not to forget to buy some more. That information gave me chills when she told me! What was more astounding was when she called me back an hour later. She had been in her bathroom and when she turned to the sink, there was a q-tip on the floor in front of her and she said to herself, "That's Scott playing a joke on me". I had not yet told my sister about the joke reference to the q-tips!! I'm sharing this with you because my sister and I had been estranged for 6 months while we were both going through a void of spiritual awakening. She contacted me out of the blue last week and we picked up where we'd left off with one difference. We had both forgiven each other for our perceived wrongs without any need for discussion or drama. My sister has been grieving this loss, essentially alone, and dealing with a lot of emotional issues about Scott for many years. This one contact with Scott has given her so much comfort and confirmation that she is on the right track and on her spiritual path. Because Scott's message came through me, it also gave her a newfound trust in our relationship. I needed to tell you about this because you are a catalyst for healing. There was no way either of us were going to get confirmation about the q-tips during the session, but Scott trusted both you and I to understand the significance of the message and get it to my sister. So thank you! You are spot on with your information whether anyone claims it out loud or not! Amazing. In the years prior to stepping out publicly as a Medium, Heather worked as a professional individual and family therapist, quietly utilizing her extraordinary and powerful gifts of medical intuition, Reiki healing, and psychic insight. Below are just a few of the many who received exceptional and efficient healing through Heather's work in this capacity. We offer these as some examples of Heather's incredible "connectedness" as well as her compassion for helping individuals heal. Please note that Heather now works professionally as an evidence-based Medium, connecting us with our passed loved ones. However should anything arise in the course of that work regarding personal life guidance and other issues, Heather does of course share that information. I was impressed at how Heather so quickly got to my root issue. It’s taken me years to get there! I knew immediately that the suggestion she had for me would be very useful, and just what I needed. I hope she continues to reach a lot of people with her obvious skills/gifts. I would like to express the wonderful reading given to me by Heather Hunter. A friend recommended her for a phone reading and Heather was right on! Many things she told me have been coming to light. I was particularly impressed with her ability to accurately pinpoint a significant health problem. Heather picked up on my years of menstrual problems right away ---from over the phone! Also there is an emotional issue I have been dealing with yet never mentioned and Heather graciously contacted me later via email to explore that as she felt upon later reflection that it was directly connected to the health problems with which I have struggled. During my reading she also picked up on the fact that it was very important for me to have time for myself to keep up my energy and health. That was so enlightening and she was right on the mark! Her intuition and visions showed to her past events in my life that had made me happy and calm. As she shared those I realized it had been years since I had done those things and forgot all about some of them, and she knew exactly the places that would help me to relax. I may not be able to physically go to these places but with Heather’s help I remember to meditate and run away for a few down time moments and it has been very refreshing. Heather I hope one day we will meet face to face. You are a wonderful person and I wish you well on your journey of helping others. Seeing Heather for private sessions has been a true delight. She is warm, caring and highly perceptive on so many levels. In my initial session with Heather I sought help for an anger issue and found that her recommendations stemming from an accurate medical intuitive reading combined with her training as a psychotherapist were insightful and comprehensive. I love her multi-dimensional approach! Through subsequent sessions this approach has resulted in the instigation of a complete life transformation! Our work together has resulted in me being able to see the blocks, patterns, beliefs and mental constructs that for so long have prevented me from knowing the truth of who I am and the joy and peace that comes with that revelation. She has helped me open my mind and open my heart. Working with Heather is like taking a breath of fresh air. Heather has an amazing gift! She was able to tell me everything about my (living) toddler granddaughter using her NAME ONLY. She had not met her, nor even seen a picture of her! I was worried about her health and sought out Heather’s services. Heather perceived her entire medical history, starting from her premature birth. She never even met her! I mean Heather got everything, as my granddaughter had a tough beginning, and has been through a lot. Heather relayed the symptoms and medical terms and diagnoses to me, and then later shared her information with the mom with great compassion and caring, as these things are hard to say to a Mom–especially a skeptical one. I am still amazed at what she knew from only a name. Not only does Heather cover the medical aliment but she can also explore the “journey of the soul” or the lessons for the soul, and possibly why these things are happening and what may be learned from them happening, as well as offering tools for support, peace, and healing. Heather’s classes are so insightful and informative. She shares and teaches about her amazing gift, and I was able to understand more about myself and my own gifts. I feel this new knowledge and insight is making me a better person. How cool is that!? You are amazing Heather! Never have I had a reading or consultation done by someone over distance, and via EMAIL of all things, that was so accurate and intensely on point. Ms. Hunter was able to get details about my health conditions from far away that even psychics I have seen in person never picked up on. Heather picked up on my health problems that, so far, had been known to only a few people very close to me. She pinpointed the 2 medical diagnoses EXACTLY, and one of them is a condition only recognized in the last several years. She also offered some techniques I can do on my own to release and heal some of the emotions she felt were connected to my conditions. I think they are helping! Heather I wanted to tell you that it amazed me how you picked up on my mother’s health issues during my own consultation with you without knowing a thing about her or ever meeting her! In fact, we didn’t learn about these issues until they were confirmed a few days later at her doctor’s visit. Also, I was so amazed at the way you brought details about my deceased mother-in-law through during our session, describing her hair-do and her favorite cake she liked to bake! Heather, thank you for the messages you received and shared with me. You are very gifted. Good luck in the future with sharing your good works. The intuitive wellness consultation Heather did for me was spot on in terms of the significant health issues I have been having with digestion and sleep. She provided a series of no-risk helpful tools and suggestions appropriate to my health and present state that will help me with these issues. I really resonated with her ideas and suggestions and am actively and enthusiastically implementing them. Heather brought forth information that would be impossible to obtain from other sources and she did so in a kind and compassionate way. She was able to skillfully discern current challenges in my life with such ease, clarity and grace. I was amazed! Heather performed an amazingly accurate reading of the physical conditions I have struggled with while we were working together in another capacity. Heather connected with my parents, who are in Spirit, who showed her the details of my conditions. Heather demonstrates a lot of strength in the field of health and medical intuitive insight. I have no doubt Heather’s healing and intuitive gifts will continue to bless many in this world! I recently had the pleasure of receiving a Reiki treatment from Reiki Master, Heather M. Hunter. While Heather was doing Reiki in my heart area, she began to receive messages from my husband who had "transitioned" 18 months prior to the treatment. The dialog was clearly specific wording that only my husband would use! Prior to the healing session with Heather, I had experienced chronic neck issues. Heather identified a particular "pain in the neck" relative, also on "the other side”, and related that person to the issues with my neck. Since the session with Heather, the neck problems have dissipated. Heather is a powerful medium as well as a healer. I highly recommend her services! Heather’s work was very insightful. I met her through e-mail. We never met in person. She only asked for my full name and age and performed all of her work via email! Heather saw in my intuitive reading considerable stiffness and body aches which I have dealt with for some time, and which was aggravated by a recent car accident. She recommended specific bodywork professionals who could help alleviate my pain. She was also correct in that I focus more on others than myself and that my soul yearns for me to turn my heart towards myself as well. I recently returned from a working trip to Hawaii, and this confirmation came to me in my dreams. I did some forgiveness exercises as Heather suggested in a cleansing ritual in the ocean. Her advice was very timely and lifted an emotional burden. Heather advised me to take plenty of vitamin D and to consult my doctor regarding the highest safe dosage for me. I did so and strengthened my dosage. Heather correctly pinpointed problems with my stomach, and suggested helpful remedies. I believe that if I continue to heed Heather’s advice I will be stronger emotionally, and spiritually as well as physically. I highly recommend her services as someone who demonstrates both knowledge and integrity in her field of work. I was 76 years of age when I first spoke with Heather. She graciously came to my home as I had not been driving for some time. Heather knew nothing about me yet just a few moments after sitting down with me, Heather informed me she felt there was an issue connected to my Parathyroid glands. She also instinctively knew I was having leg pain, and though she did not have the scientific or medical reason why, she felt the two were connected. Heather also intuitively knew several of the medications in my system. At Heather’s suggestion I immediately consulted an Endocrinologist and had a series of blood tests done which resulted in a need for some scans done on my Parathyroid glands. The scans revealed a nodule on one of the glands and the blood tests showed a high level of Parathyroid hormone and calcium in my blood. I was told my body was losing calcium due to my parathyroid issue. The diseased parathyroid caused my bones to leech calcium, which leads to Osteoporosis. The affected Parathyroid was surgically removed last October and now the PTH and calcium levels in my blood are at normal levels. After having a bone density scan around that same time, I learned that I do have Osteoporosis but thanks to Heather it will not progress any further and my body can start the process of building new, strong bone. I had been in discussions regarding knee surgery for my knee and leg pain, and Heather discussed with me postponing the surgery. Sure enough, after the parathyroid issue was resolved, my leg and knee pain was significantly reduced. I am NOT having surgery! I feel that Heather is a very gifted, caring, compassionate lady and I felt very comfortable speaking with her so thank you Heather and God Bless You for all you have done! Florence N., Scottsdale, AZ. I worked with Heather when I was struggling to overcome a long standing illness. At the time I was depressed and felt no hope for the future. My one on one intuitive/holistic counseling and Reiki sessions with her over a 4 month period of time gradually and gently instigated a change in me, an energetic shift so to speak. I became hopeful, inspired and motivated. My body finally became able to heal as Heather directed me to triggers, which I learned I could control, that were exacerbating my condition. As a result of my healing I had the motivation and self-empowerment to take my yoga teacher training certification and am now on my way to becoming an aroma therapist. Thanks to Heather for her insight, ability to motivate and inspire real change. The tools, exercises and energetic healing she shared with me helped through a difficult life transition. I’ve worked with many therapists in my 50 years, and yet I have never received as much information to work with as I have with Heather Hunter, MA. She offered me insight and revelations that allowed me to open up blocks I thought I’d already taken down. Her ability to see things I’ve hidden, really blew me away. I even feel better physically as a result. There aren’t enough people in this world with genuine compassion and enthusiasm, and that is the gift Heather offers to the people she works with. Tuning us all into a higher vibration, and allowing us to work with ourselves, with the bigger energetic picture, instead of against our thought patterns which have failed us, is something no one else seems to offer. I can’t thank her enough for the gifts she offers and look forward to working with her more in the future. I have had several intuitive counseling sessions with Heather and she has always been spot on with patterns and behaviors that have been holding me back. Each session gave me valuable insight into those patterns and allowed me to find the solutions to work through the issues. Whenever I feel stuck I reach out for Heathers guidance to help me find the key to what is holding me back! I am a Reiki Master and have had many Reiki treatments in the past twenty years. When Heather Hunter treated me to one of her wonderful Reiki treatments I was under a lot of stress and had severe pain in my neck and ankle. The results were exceptional. I was so relaxed and pain free when we were finished, I had tears in my eyes from the release of pent up emotions. I encouraged Heather to continue using her gift of energy healing on others. Heather is a very gifted person!